Although the Rangeley to Horsepasture Creek route is unclear you can reach the creek ford by turning right on the Preston Road (Route 687) and then left on 695. After much winding 695 leads to this scene (1st picture) - the bridge over Horsepasture Creek. Pause as you cross the bridge and look to the right. Notice the cleared area up the hill to the left. 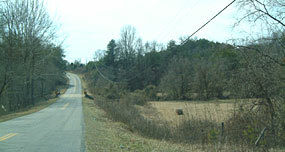 (2nd picture) This is a portion of the old road. Continuing along 695 turn right on the airport road and then look right to see the other end of that cleared area at the top of the hill. 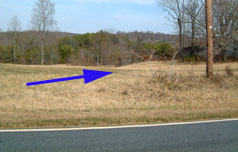 (3rd picture - blue arrow ). 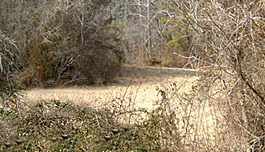 From here the old road crossed the runway and continued on toward present day Route 58.